Global OTT TV and video revenues will reach $64.78 billion in 2021; a massive increase from $4.47 billion in 2010 and $29.41 billion in 2015. From the $35.37 billion extra revenues between 2015 and 2021, Asia Pacific will contribute $12.65 billion, Western Europe $8.25 billion and North America $9.00 billion. The Global OTT TV & Video Forecasts report estimates that Latin American revenues will nearly triple, with even greater growth expected in Eastern Europe and the Middle East & Africa. The report now covers for 100 countries – up from 64 in the previous edition. The US will remain the dominant territory for online TV and video revenues – which will rise by $8.24 billion to $22.82 billion between 2015 and 2021. China will add a further $6.24 billion, with its total revenues nearly quintupling over the period to give it second place. SVOD will become the largest revenue source by 2018, but AVOD will regain top position by 2020. SVOD will add $14.58 billion in revenues between 2015 and 2021, with AVOD up by even more ($15.37 billion). Online TV and video advertising has been boosted in recent years by the rapid growth in mobile advertising. Fast growth will continue; reaching a global total of $26.96 billion in 2021. SVOD revenues will soar from $0.89 billion in 2010 to $11.13 billion in 2015 and onto $25.71 billion in 2021. This means that SVOD will contribute 40% of total OTT revenues in 2021; double the 20% recorded in 2010. Digital TV Research forecasts 383 million SVOD subscriptions by 2021, up from 21 million in 2010 and 163 million by end-2015. From the 220 million SVOD additions between 2015 and 2021, 107 million will be in the Asia Pacific region and 28 million in the Middle East & Africa. The North American market has still not reached maturity, with 28 million additions expected between 2015 and 2021. Western Europe will bring in an extra 30 million to its total. 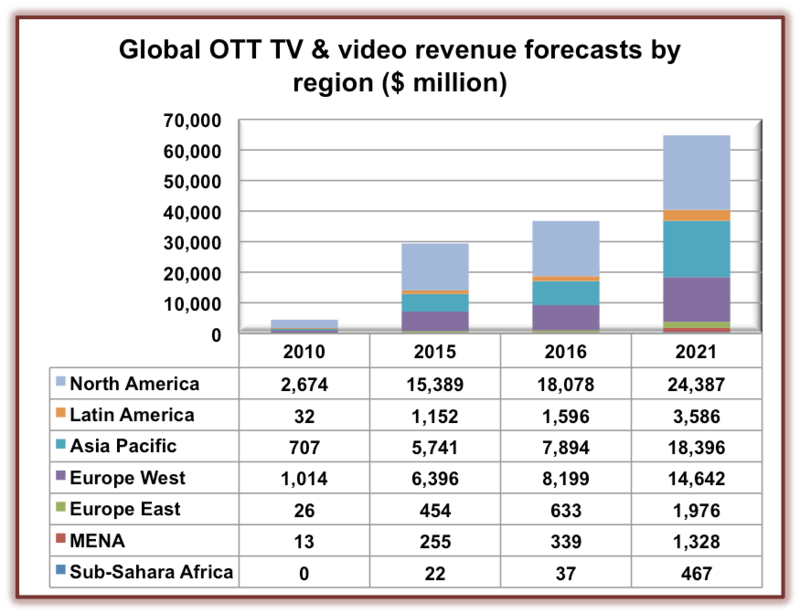 For more information on the Global OTT TV and Video Forecasts report, please see the Broadband TV News webshop.